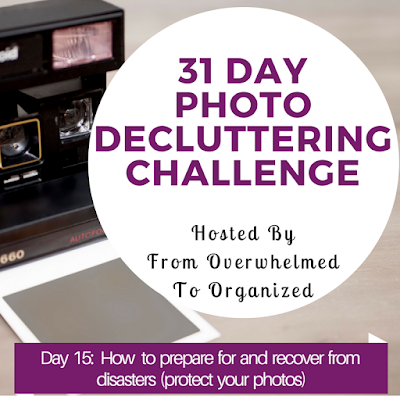 One of the biggest reasons many people are participating in this challenge is to declutter their photo collection so that they can put measures in place to safeguard it from disasters. For printed photos that may mean decluttering your collection enough to be able to scan and backup your photos. For digital photos that likely means decluttering your collection enough to be able to back it up in multiple places. I know for me it's both. I have a backup of my digital photos, but it's a huge file because I have SO many digital pics. And I only have it backed up in one place and that hard drive is in my home so it still would be potentially ruined in a disaster. I want to be able to either back up my photos to the cloud (but a much smaller file to save costs) or back them up onto a data stick that I can store in my fireproof and waterproof box (again a smaller size collect would be easier to backup regularly onto that stick). My photo albums are completely unprotected if something ever happens to our home. We've actually had both a flood and a fire in our basement and either one could have done serious damage to or even destroyed all my photo albums. Thankfully they were all fine but it was a wake-up call. Well I guess not a really serious wake-up call since the fire was 10 years ago and the flood was 7 years ago. Yikes! But I finally made it a priority to deal with my printed photos and that's why I'm doing this challenge this month. So, I don't want to scare anyone, but in light of all the hurricanes, floods, earthquakes, and fires in recent months, it's really important to protect your memories. I'm no expert in this field, so I'm going to refer you to the photo experts. Here's a great list of disaster resources on the Save Your Photos website by the Association of Personal Photo Organizers (APPO). There are resources to help you protect your pictures as well as recover them if you've been hit with a disaster. There's even a free online course about dealing with water damaged photos. I highly recommend you check out all the resources on that page! Today I decluttered the rest of the stack of photos I pulled out of yesterday's big album. I decluttered 204 pictures, which was about 2/3 of the pile. Many of the pictures in this album were pictures from my camp days with people I don't remember (easy to declutter) or combinations of people that I do remember (I chose some group photos that had the most people in them and let go of lots of pictures with just myself and one other person). There were also pictures from several different vacations with lots of landscapes or other scenic pictures (I chose a few favourites or ones that also had people in them). Because I just chose a few favourites for each of those types of pictures I was able to declutter a lot more than from some albums. This round of decluttering brought my overall average up to 56% of the pictures in the albums I've decluttered so far. Today your task is to check out the resources listed in today's post. Decide which ones are most relevant to you and your photo collection. It's the mid-point of this challenge and if you're starting to lose steam, remember why you started this challenge (I'm guessing it's related to protecting your photos from disaster). 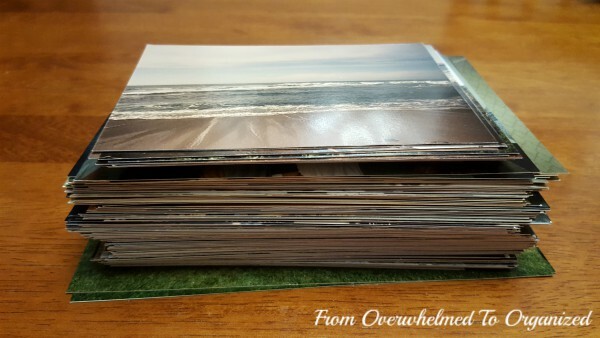 Let today's post inspire you to keep decluttering so you can fully protect your photos! How are you doing in the 31 Day Photo Decluttering Challenge so far? How do you think today's tip will help you? What photos are you decluttering today? How prepared are you for a disaster? Have you ever had to recover your photos from a disaster?